An eerie full moon in an abandoned town peered across the sky. The ebony, moonlit sky was scattered with numerous stars that periodically blinked. They shone over the roof tops of the town which was surrounded with a deafening silence. Cricket chirps were the only noise that filled the air. Nestled in the heart of the town stood an ancient stone church which towered proudly over the other buildings. As the wind blew in the town where there was no-one to be seen, washing clung to the line for several more hours; a sign that people had fled. Suddenly, in one swift motion a moth-like creature descended upon 2655 Kensington Avenue. Hesitantly, the intriguing creature grasped the edge of the shutters with his long, bony fingers. As he took a step forward he pushed the door ajar. 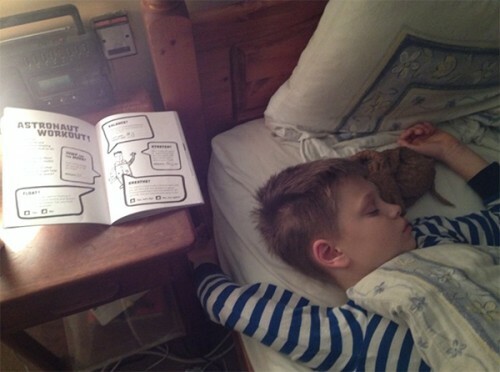 Noticing the sleeping children he quietly consulted with his notebook which he kept in his back pocket. As he checked the address he was relieved to know he had reached his destination. The deprived young children were snoring while sleeping contently, despite the absence of their parents. As the little orphanage boy slept peacefully in his checkered bed, the creature perched upon the ledge. He entered the old, wooden building peering around the children that surrounded the room. children were scared of the dark and needed to feel safe, so this was the best action. Before very long, the visitor fluttered down and lay his hessian bag on a child’s bed. His eyes widened as he peered inside, with the light shining on his face. As he made his way to the first six-year-old child, he took out a glimmering egg an cracked it open. Inside every egg was a dream that belongs to each and every child. It was quite unclear exactly as to what or who he was. He poured a part of the magical insides onto a little pair of ballet shoes which lay at the bottom of a deprived young girl’s bed. With one splash of magic the shoes turned bright pink and a little dancer started dancing across her bed. She smiled contently as she lay there in peace; a feeling that influenced her dream. Beams of light filled the room as swirls of stars surrounded the astronaut. As the swirls increased in speed the young space cadet was swallowed by a hungry vortex. Lying in a ball on the dusty earth, the boy awoke and examined his new surroundings. The rainforest! Butterflies gathered and fluttered sound his head as a little one floated and silently landed on his finger. Suddenly he noticed something out of the corner of his eye. A little rock had been nudged. Carefully he placed it into the right position. The light climbed and ominous clouds gathered as the darkness descended. As time went on he walked further into the forest. Remnants of an Aztec tribe were littered around. An old skeleton was perched against a rock; an indication that there had been no life for some time. A piercing pair of narrow slithers of lime green light penetrated the darkness. Suddenly a ferocious growl thundered from within a cave which ricocheted from every surface. Panicking, the boy froze instantly to the spot. Hesitantly he backed away before turning to run. He ran and he ran and he ran. Faster, harder, quicker. The dust clouds travelled behind him. The beast continued to stalk him. His fate was sealed; he was bound to die. All of a sudden bombing eggs started to gather around the beast. Gnarly roots started wrapping around eventually turned it into a trap. With his arms covering his face sweat dripped down his brow. He was safe. With a jolt he awoke from his dream. A firefly noise was heard as it passed. He looked at the open window with wide eyes … What was it? 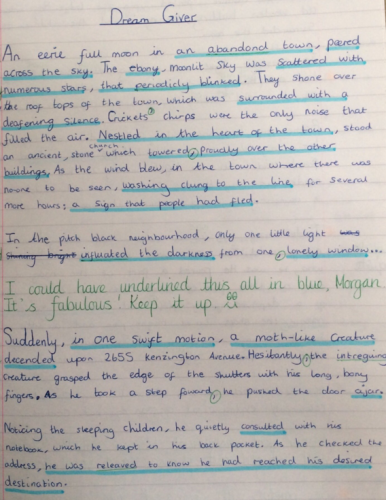 This gripping tale was written by Morgan from Simonside Primary School and we absolutely had to post it because we were enthralled from the first sentence! 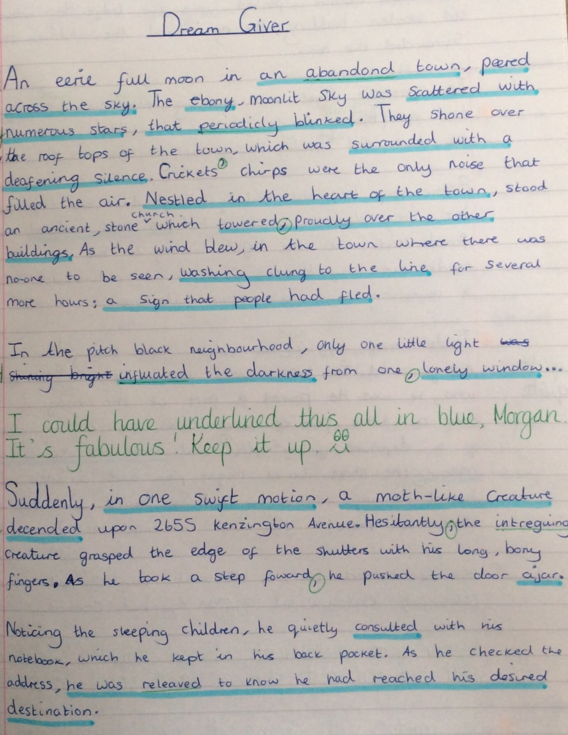 Thank you to Miss Lisa Pegman and Morgan for sharing this excellent piece of creative writing with us. Keep up the good work! 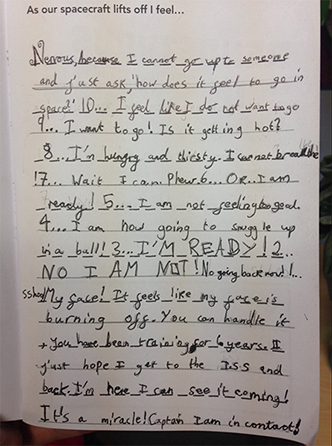 Here’s a small selection of some of our favourite pics from the Space Diary programme. 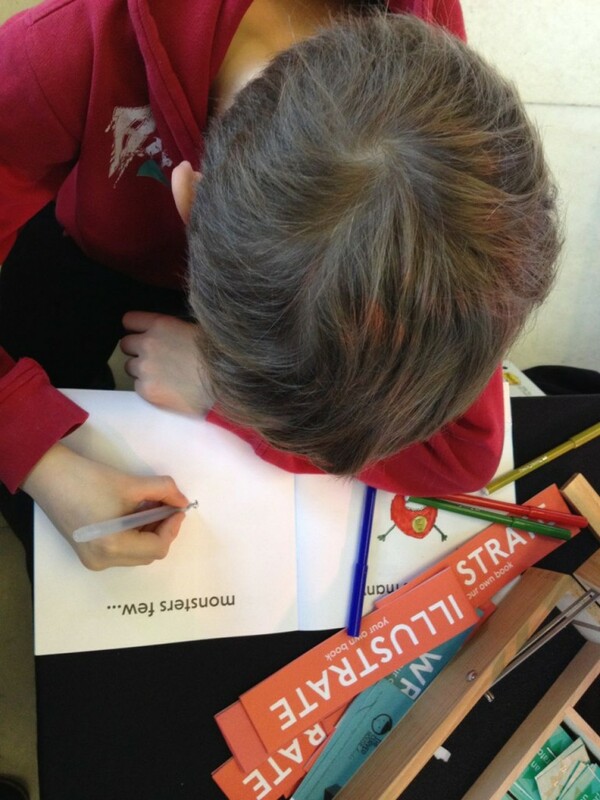 We’d like to thank all the teachers, schools, parents and guardians for participating by using the #spacediary hashtag on Twitter, it makes us incredibly happy to see all the kids having so much fun with their Space Diaries! 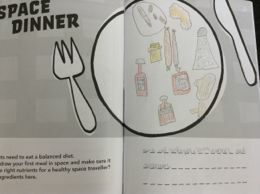 If you would like to be featured or see how other schools and groups are using their Space Diaries simply tweet us @CurvedHouseKids and use the hashtag #spacediary. You can also view more images from the project over on on our Mission Feed! 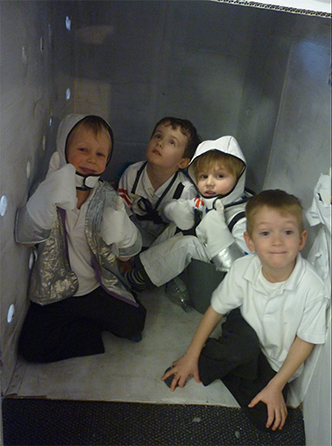 Shrubland Street Primary begin their astronaut pre-training. A Hillmead Primary School student exhausted after a fun day of Space Diary activities! Try not to be afraid to ask questions about the way things work in the world around you. This month, our Principia Mission Space Diary investigates some of the things astronaut Tim Peake might see in space, like the planets in our solar system. All the planets orbiting our sun are unique. They have different landscapes, atmospheres and rotation speeds. To help our young Space Apprentices explore the planets without having to leave Earth, we’ve put together some information for them. 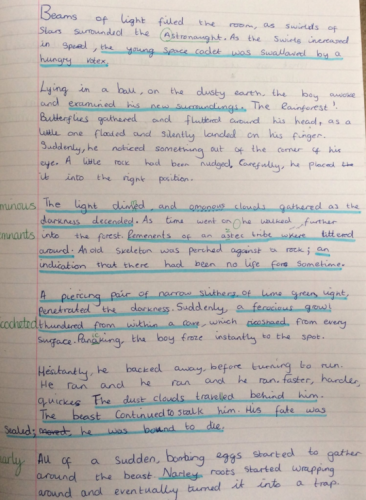 A huge thank you to Year 11 student Anna Fleming, from St George’s School for Girls in Edinburgh, who’s written a fabulous piece for us about Mercury. Thank you Anna for leading our expedition into outer space! Daytime temperatures on Mercury can reach 800 degrees Celsius. This is because the sun is 38.98 miles from Mercury. Compare this distance to Earth’s distance from the sun – 91.4 to 94.51 million miles – and you can see just how exposed Mercury is to the sun’s heat. The scorching heat of the day is followed by freezing nights – Mercury is a planet of two extremes. Night time temperatures can go down to minus 290 degrees, as cold as deep space. At this temperature, you would freeze to death instantly. It gets so cold because Mercury does not have an atmosphere to trap heat and regulate temperature. Due to these extremes in temperature, it is impossible for water to exist on Mercury. During the day and the night, the sky over Mercury is black, also due to the lack of an atmosphere to scatter the sun’s light. Its surface is similar in appearance to our moon, with craters from meteorite impact dotted around and regions of smooth plains. Most of the craters were a result of Mercury being heavily bombarded with meteorites 4.6 billion years ago. These craters can span hundreds of kilometres across and 2 kilometres deep – better watch your step! There is no weather system on Mercury due to the lack of atmosphere, meaning you wouldn’t have to worry about any storms or hurricanes. However, there are the extremes in temperatures and the occasional earthquake due to compression forces ‘shrinking’ the planet. The gravity on Mercury is only 38% strong as the Earth’s. This means you could jump three times as high and would be able to easily pick up really heavy objects. Playing football in these gravity conditions would be difficult. The ball would stay in the air for a long time and would go huge distances even with a gentle kick. You would need a much larger pitch and be prepared to use big leaps and jumps to get the ball. Venus is the hottest planet in our solar system. Its surface can reach temperatures of up to 480 degrees Celsius. This is because it has a permanent layer of thick clouds, which trap in the heat and cause a greenhouse effect. The heat has boiled all the water out of Venus’ atmosphere, which means its surface is too hostile to sustain life. Venus is not a very welcoming planet. Beneath its clouds of sulfuric acid droplets is a landscape of volcanoes, mountains and craters. Temperatures during the day and night are similar, because of the solar winds which move slowly across Venus’ surface. These winds aren’t like a refreshing breeze though – they only make Venus hotter. Even though scientists think Venus might once have been a lot like Earth, possibly even with oceans, it has no moon or any seasons. The reason there are no seasons is because Venus doesn’t tilt on an axis, the way Earth does. The days on Venus are very, very long because Venus spins so slowly. It takes 243 Earth days to equal one day on Venus. Imagine how long that would make your school day! Venus also spins in the opposite direction to the other planets in our solar system, with the sun rising in the west and setting in the east. This may have been caused by an asteroid colliding with Venus and changing its rotation. The days on Venus might be long, but the years are short – shorter than the days in fact! It takes only 225 Earth days for Venus to orbit the sun, making its year shorter than its day. If you are 10 on Earth, you would be 16 on Venus, but you would only have been alive for 15 Venus days. There’d be days on Venus when you’d have to have more than one birthday! Despite its harsh landscape and strange rotation, Venus is the brightest natural object in the sky, after the moon and the sun, of course. Because it’s so bright, lots of ancient civilisations had myths about it. This may also be the reason that it was named after the Roman goddess of love and beauty – quite a contrast to its barren and hostile landscape! Our home planet is the only planet in our solar system known (at present!) to support life. Everything Earth’s inhabitants need to stay alive exists under the thin layer of Earth’s atmosphere, which divides our world from outer space. Earth is a solid planet whose surface is covered in diverse terrain: mountains, forests, valleys, plains, polar caps and deserts. But one of the key differences between Earth and the other planets in our solar system is water. Around 70% of the Earth’s surface is covered in oceans, and we have rivers, lakes and other bodies of water on top of this. Earth’s water was originally trapped within the planet, but over time volcanic action brought this water to its surface. Earth has an ozone layer, made from a special kind of oxygen. Like a protective shield around the planet, the ozone layer absorbs most of the sun’s harmful UV rays. This is why preserving our ozone layer is so important – we don’t want to let those nasty rays into our home! Did you know that your compass wouldn’t work the same way on other planets? Earth has a powerful magnetic field, which we’ve been using for centuries to help us find our way. Scientists believe that it exists because of Earth’s rapid rotation on its axis, and its nickel-iron core. But our magnetic field isn’t just a useful navigation tool. It protects Earth from the effects of solar winds. Solar winds are charged particles that flow from the sun. They can travel at up to 900 kilometres per hour, and reach temperatures of one million degrees – Earth would be very different without our protective magnetic field! Mars has fascinated Earthlings for a long time, and not just because of its unusual red glow. Scientists believe intelligent life once lived on Mars, which led to the theory of Martians. This is partly because Mars is similar to Earth in many ways. It has seasons like earth, even though these last twice as long and are more extreme than we’re used to, and is the only other planet with polar caps. Ice water has been found beneath the Martian polar caps, and there’s also evidence of water in the icy soil and thin clouds. The atmosphere is too thick for water to exist as a liquid on the surface of Mars, but the terrain suggests that there were floods long ago. Because of the presence of water, scientists are researching whether it might be possible for people to live on Mars one day. Like Earth, Mars has volcanoes and canyons. One vast canyon system runs along Mars’ equator and is as long as the United States. And we think the Grand Canyon is big! Mars has our solar system’s highest mountain, which is called Olympus Mons. This mountain is a volcano 21 kilometres high and 600 kilometres wide. Mount Everest is 8.8 kilometres high. Can you imagine something nearly three times higher? Scientists have found evidence of lava on Olympus Mons, which means it’s still an active volcano. It’d be exciting to see it erupt from the ISS! Even though Mars has some similarities to Earth, there are lots of differences too. Instead of one moon, Mars has two. They’re called Phobos and Deimos. They are much smaller than our moon, aren’t smooth and round, and orbit quite close to the Martian surface. Mars has gravity like Earth, but it’s only 38% as strong. This means that you could jump more than three times as high on Mars. The days on Mars are only a little bit longer than on Earth – 24.617 hours – but one year takes 687 Earth days. This is because of Mars’ big and elliptical orbit, which gives Mars six seasons instead of four. These extra two seasons are called perihelion, when Mars is closest to the sun, and aphelion, when it’s furthest from the sun. The elliptical shape of Mars’ orbit also creates the largest and fiercest dust storms in our solar system. These can last for months and cover the whole planet. It wouldn’t be much fun living on Mars during one of these storms! Jupiter is the biggest planet in our solar system, which is why it was named after the Roman god of gods, and the god of the sky. Jupiter is so massive that it would take eleven Earths lined up side-by-side to equal the distance from one side of Jupiter to the other, and 317 Earths to equal its mass. Unlike Earth, Jupiter doesn’t have a solid surface. It’s one giant ball of gas. This means there’s nowhere for a spacecraft to land. Jupiter has a unique cloud layer in its upper atmosphere, which gives it its unusual marbled appearance. Its cloud belts are made of ammonia crystals and sulfur – imagine how that would smell! Jupiter also has three rings: two faint outer rings and one thick inner ring. Jupiter has 67 moons in total, all orbiting around it. Its moon called Ganymede is the biggest moon in our solar system. All these moons whizzing around Jupiter make it a bit like a solar system. Scientist believe that if Jupiter was just 80 times bigger, it would have turned into a star, like our sun. Jupiter wouldn’t be a very nice place to visit, even if there was somewhere to land. Its pressure is so intense that anything that gets through its clouds is crushed and melted. It also has a giant storm called the Great Red Spot. This storm is bigger than Earth and has been raging for hundreds of years! If you lived on Jupiter, you’d have a very short day at work or school because your whole day and night would be just under ten Earth hours long. Even though your day would be short, your year would last nearly 12 Earth years, so you’d have to wait a long time for your birthday. You’d have plenty of time to plan your party though! Saturn is famous for its seven rings, which often make it people’s favourite planet. These beautiful rings have puzzled scientists since they were discovered by Galileo in 1610. The ring system is made from billions of particles, which can be tiny icy grains or as large as mountains. The reason we can see the rings from Earth with a telescope is because they’re made from ice. If you’ve seen a frozen lake on a sunny winter’s day, you’ll know that ice is very reflective. Just like the planets moving around the sun, each ring orbits around Saturn at its own speed. Like Jupiter, Saturn is a gas giant, made from hydrogen and helium, the same gas we use to fill up balloons. Saturn is the least dense planet in our solar system. Because it’s mainly made of hydrogen, it’s less dense than water. This means it could theoretically float if you found a bathtub big enough to put it in. 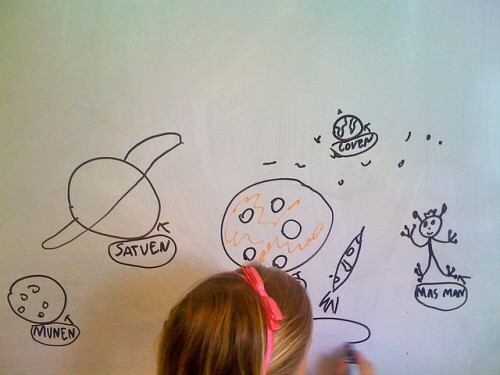 Saturn has 150 moons and some smaller ‘moonlets’. Each moon is frozen like an ice cube. Saturn’s moons all have interesting and unique qualities, which scientists are still discovering. The moon called Enceladus appears to have an ocean hidden below its frozen surface. Another moon, called Titus, looks like it may have life on it, but its frozen surface of liquid methane lakes and landscape of frozen nitrogen would mean life would be very different to the kind we know on Earth. Another moon called Pan orbits within the main rings of Saturn, sweeping materials out of a narrow space called the Encke Gap. Saturn has an unusual hexagon shape which surrounds its north pole. The hexagon is a six-sided jet stream which rotates. It is so big that it spans 30,000 kilometres – more than twice the diameter of Earth! The discovery of this strange phenomena thirty years ago helped scientists calculate the rotation speed of Saturn, which is 10.7 Earth hours. Even though you can’t see Saturn’s rings without a telescope, you can still see the planet from Earth. It’s a pale yellow colour because its upper atmosphere contains ammonia crystals. On Earth, we often use ammonia in cleaning products, especially for glass and stainless steel. Do you think this would make Saturn sparkling and clean? Uranus is a cold and windy planet made of gas. It was the first planet to be discovered by telescope, which means you can’t see it from Earth with the naked eye. If you get a chance to look at Uranus, you’ll see it’s a pale blue colour. This is because its upper atmosphere is made from water, ammonia and methane ice crystals. Since its discovery in 1781, scientists have learnt all kinds of interesting things about Uranus, like its strange tilt. Its equator is nearly at right angles with its orbit, meaning that it spins on its side. Instead of moving like a spinning top around the sun like the other planets, Uranus looks like it rolls around the sun. Because of this, scientists have given it the nickname ‘the sideways planet’. Their theory is that something the size of Earth collided with Uranus, dramatically changing the angle it rotates at. Like Earth, Uranus has seasons, but these are very different from the seasons we know. Each season on Uranus lasts 42 years! One hemisphere of the planet will have non-stop daylight and heat, when it faces the sun. During this time, the other half of the planet has a long, dark winter. The planet slowly rotates so that the other hemisphere is facing the sun, and the seasons reverse. You’d have a very long summer holiday if you went to school on Uranus! Even though Uranus has such a long summer, it’s the coldest planet in our solar system because it’s so far away from the sun. Uranus is called an ‘ice giant’ planet, because it has an icy mantle which surrounds its rock and iron core. Its minimum surface temperature is minus 224 degrees Celsius – you wouldn’t need a fridge! Uranus has 13 rings, but they’re not spectacular like Saturn’s. Uranus’ strange tilt means its rings are perpendicular to the sun. Scientists think the rings are made from pieces of comets and moons that collided and broke apart. The dust and debris caused in these collisions is the reason why Uranus’ rings aren’t as beautiful as Saturn’s icy ones. Some researchers believe these rings are still very young, so who knows how they might change over the next few centuries! Earthlings didn’t know Neptune existed until 1846 because it is so far away from our home planet. It takes such a long time for Neptune to move around the sun – 165 Earth years – that it has only completed its orbit once since humans discovered it. Even though its year is so long, a day on Neptune only takes 16 Earth hours. This is because it spins very quickly on its axis. Neptune is cold, dark and very, very windy. Its supersonic winds are three times stronger than those on Jupiter and nine times stronger than Earth’s winds. Not very good weather for flying kites! Are you afraid of storms? Then Neptune isn’t the place for you. Neptune’s biggest storm is called the Great Dark Spot, which is about the same size as Earth. The longest storm on record started in 1989 and lasted five years! Neptune has a second, smaller storm which is about the size of Earth’s moon and is called the Small Dark Spot. Neptune is an ice giant like Uranus. It’s made from a combination of water, ammonia and methane. The layer of methane gas above its clouds gives Neptune its blue colour, which is why it was named after the Roman God of the Sea. Methane absorbs red light, which is why this planet looks so blue. There are fourteen known moons orbiting Neptune. The largest moon – Titan – is one of the coldest worlds in our solar system. It spits out particles of nitrogen ice and dust from its surface – not very welcoming for space explorers! Like Uranus, Neptune also has six faint rings. These are made from ice particles and grains of dust coated in a carbon-based substance. Scientists believe these rings are very young, and won’t last for a long time, so Saturn doesn’t have to worry about being outdone! Congratulations on completing your mission to explore our solar system. Have a safe journey back to planet Earth, Space Apprentices! Whatever you want to do in life, never lose sight of your dreams. Today in Year 3 we have witnessed the most amazing thing! We all sat together and experienced a once in a lifetime event. Tim Peake made history by becoming the first official British astronaut to go to the ISS. Over the past few weeks we have learnt more about space through our Space Diaries, preparing ourselves to become astronauts, and watched many videos from aboard the International Space Station. The more we learnt about life in space, the more we couldn’t wait until lift off. This morning we were all extremely excited by the fact that we could see Major Peake blast off, all the way over in Baikonur Kazakhstan. 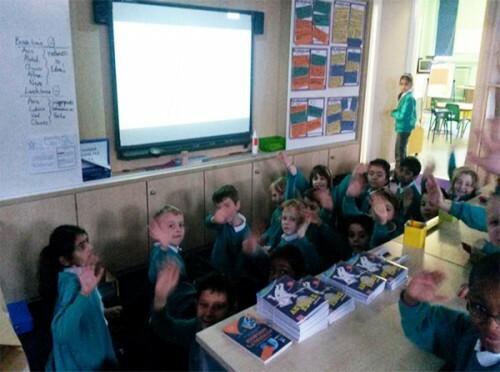 We huddled together in Mrs BB’s classroom and watched the BBC coverage of the launch. We learnt so much from the presenters, from the training that astronauts undertake to the importance of their space suits. We eagerly waited for the countdown and as soon as the timer in the corner got to 10, we joined in with the countdown. As the counter reached zero the whole of Year 3 cheered, along with people all around the world, as we watched the rockets propel Tim and his team towards space. We all felt overwhelmed with happiness as we saw the rocket successfully leave the launch pad, and were excited to find out more about what Tim would get up to. To make it even better, as the rockets ejected themselves from the craft, Tim turned to the camera gave a big thumbs up and a wave, then went back to concentrating on his flight checks. It felt like Tim was waving to us thousands of miles away in Aldridge. We will all be rushing home tonight to turn on the television to see how Tim and the team have progressed, and cannot wait until we hear him talk from aboard the ISS. What a fantastic morning for us all and the start of an awesome adventure for Tim and his crew. 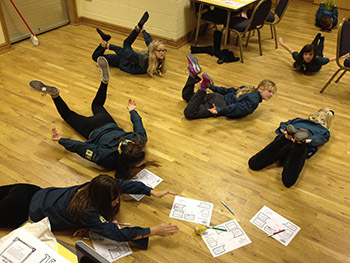 The young people in the 27th Lincoln Scout Group, with the support of Eagle Community Primary School, are headed for an out-of-this-world orbit whilst creating a lasting record of their involvement in the Principia Mission. As Major Tim Peake lives and works on the ISS, conducting scientific experiments like determining the ability of human life to survive, grow food, and undertake activities in microgravity conditions, we will be following along on Earth. 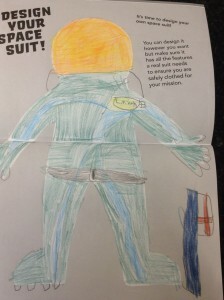 Our group will imaginatively document their experiences in a unique Space Diary from Curved House Kids and the UK Space Agency Principia Mission outreach programme. 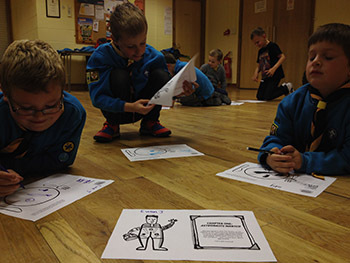 This week all seventy of our young people (aged 6 to 14) and leaders started their diaries, putting themselves into the boots of a real astronaut, and living up to the scouting motto, to find out how prepared we would be for space. Watching the introduction video from Lucy Hawking and Dallas Campbell, we found out why it is so important to be fit and healthy for space. 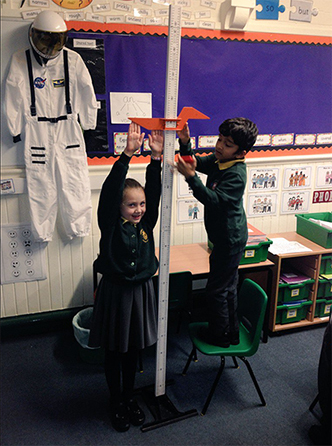 Then we completed an Astronaut Workout – jumping for space, stretching up to measure how tall we are, perfecting our balance and floating postures, as well as steadying our breathing to remain calm in our space suits. The young people used these results to consider and discuss the physical impact on our bodies from being in a weightless environment. 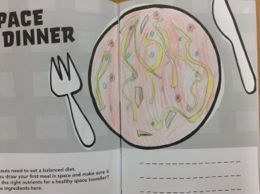 Finally, we had a look at nutrition and the sort of food astronauts – past and present – would eat, and designed our own healthy meal in our diaries to be packed up for our mission. Our own space journey began at the beginning of October, on a group camp titled ‘There’s No Place Like Space’ which coincided with the launch of International Space Week. Imaginations were unleashed on our ‘Area 51’ camp area with its own mission control (camp/office), ISS (kitchen and mess tent) and briefings in the ‘air lock’. 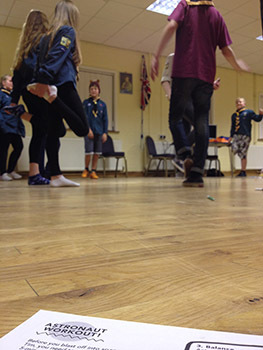 Young people became space cadets for the weekend, split into mixed section/mixed age teams named after pods on the ISS (Unity, Harmony, Destiny and Quest), to take part in activities that accumulated points in our own weekend space race. Our space race challenges included scaling the climbing wall in ‘Planet Exploration’ and decorating souvenir neckerchiefs with space related designs for ‘Space Pennants’, as well as pitching and striking a tent as part of cadets’ survival needs. ‘Ignition’ found the young people building and igniting small fires to be the first team to boil water, and in ‘Rocket Launch’ they explosively launched decorated plastic bottles using a foot pump and hosepipe to create hydro pressure. ‘We Come in Peace’ – interacting with other life-forms at camp fire – was a huge success and a ‘Spaced Out’ quiet area was used by many of the young people under the umbrella canopy of a glowing solar system for a quiet few minutes and planetary discussion. Even our menu was given a celestial makeover with dishes such as Black Hole Breakfast, Gibbous Grub, Moon Rock Meatballs, Radiant Wraps and Cosmic Cocoa. 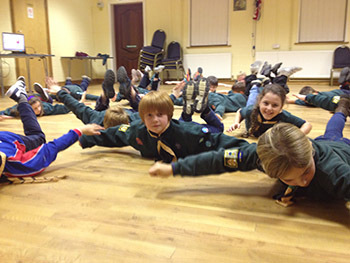 As with any structured learning, our Scouting programme sets out requirements for all ages, making a balance of activities that not only cover traditional outdoor pursuits but a full range of interests and activities. 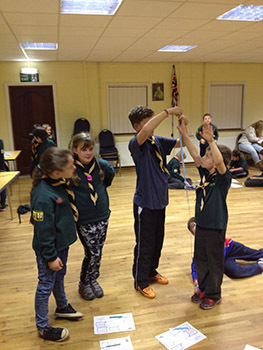 From learning the names of planets to making a scale model of the solar system, or from knowing what to look for in the night sky to building our own satellite dishes…it’s all part of the Scouting programme. It’s not all science though; the Principia Mission has given us opportunities to explore humanity itself. Last week we prepared for a Remembrance Sunday parade, taking time to remember the servicemen, women and animals who have given their lives and those who continue to risk theirs. We also reflected on what symbols might be fitting to represent the many humans and animals who went into space, giving their lives to progress the space programme for mankind. We will display these symbols and take time to remember them all during our meeting on 28th January, the NASA Day of Remembrance. During a ‘Top Secret’ briefing, the group was told of their involvement in the Principia Rocket Science project with RHS Gardening for Schools. We are so excited to know that Tim will be looking after rocket seeds on the ISS that will be making their way to us in Spring 2016, to grow and add our results into the national database. 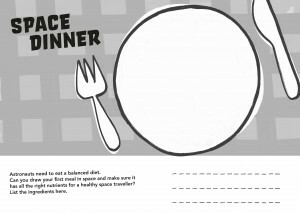 We’ll be enhancing our Space Diary use with Principia materials such as Mission X: Train like an Astronaut and Heston Blumenthal’s Design a Space Dinner as resources for diet, healthy eating, exercise, gardening and scientist/experiment badge work, whilst completing the 250 mile Space to Earth challenge during our hikes and expeditions. Our Scout programme links perfectly with the Space Diary chapters to inspire another generation into scouting, science and space exploration. On camp, we had a ‘Scouts’ Own’ time allocated for reflection and spiritual thought. We talked about Tim, his hard work and perseverance, just two of the many positive qualities that have led to his incredible mission. We also thought about Rick Mastracchio, a NASA engineer whose applications to be an astronaut were repeatedly knocked back. Rick did finally make it to space nine years after his first application, because he refused to give up on his dream. We became confident of opportunities still to come, hopeful that whatever our dreams, whatever we already know, there is always something new to be found if we are brave enough to go and look for it, while recognising that it will take boundless enthusiasm and determination to get us there. Anything worth having may not be achieved in one giant leap, but through many small steps. It is reputed to be lonely up in space but we are going to have tremendous company taking our first mission steps, proudly alongside our very own rocket man, Tim Peake, using our Principia Space Diaries. 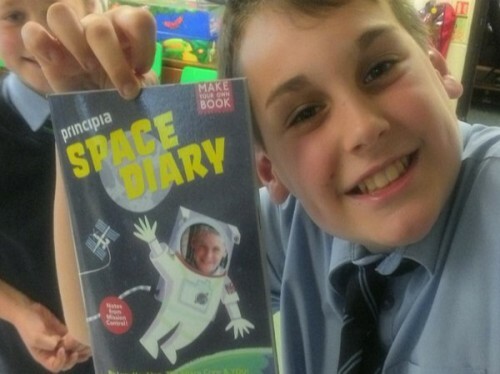 We are thrilled to announce that the UK Space Agency/ESA have extended funding of the Principia Space Diary project, doubling the number of UK primary school students who will receive copies of the book. That’s twice as many space apprentices, and twice as much fun! 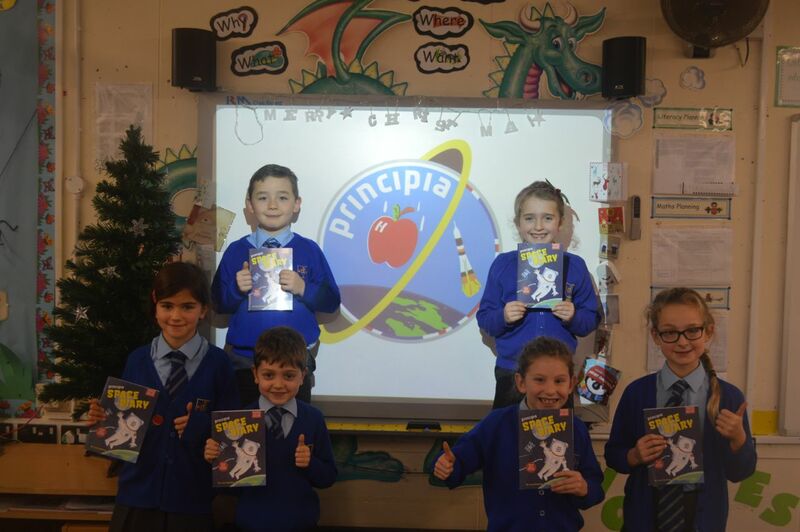 We launched the Principia Space Diary in October with the aim of registering 15,000 UK school kids. One month later we are celebrating sign-ups for 30,000 children to participate in this project. What an amazing response from schools across the UK who have shown such enthusiasm for this and other Principia projects. 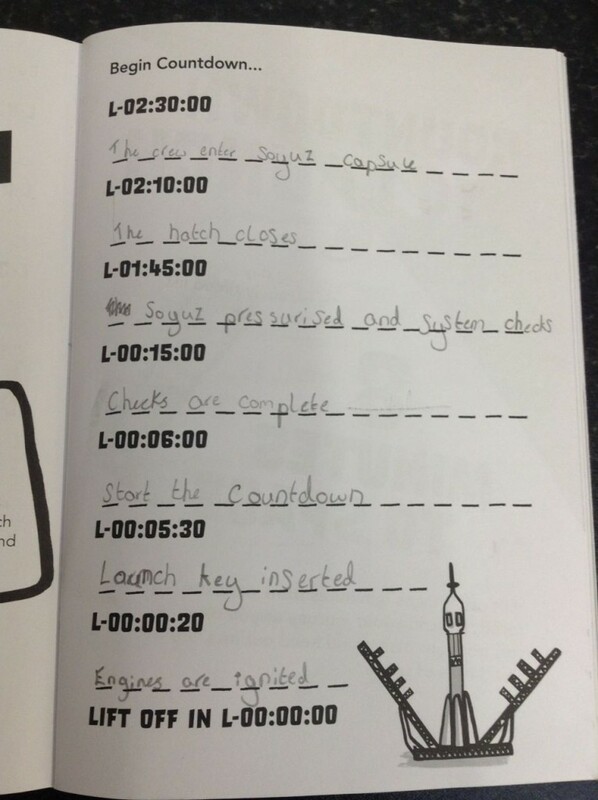 Our own Principia project is the Principia Mission Space Diary that allows primary-aged children to document Tim’s journey and work their way through a space apprenticeship. Schools who signed up before today will receive printed books, delivered to them before Tim’s launch on the 15th December. Anyone who registers from today onwards (including schools, home educators, community clubs, after-school programmes etc) will automatically register for the online version of the programme, giving you exclusive access to the book in PDF form to download and print yourself. This is a STEM-literacy project written by author Lucy Hawking and Professor Peter McOwan from Queen Mary University of London. It presents complex ideas is a simple, visual way and is designed to strengthen science, literacy, visual literacy and numeracy skills; expose children to the breadth of careers in the space science sector; help them learn about themselves; and make sure they have fun. Feel free to contact the publisher, Kristen Harrison (kristen@thecurvedhouse.com), if you’d like more detail about our methodology. If you haven’t already signed up, visit principiaspacediary.org. This is your chance to create a lasting memory of Tim’s historical journey. 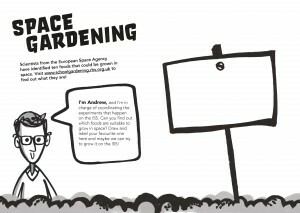 15,000 schoolchildren invited to write and draw their way into space with British European Space Agency (ESA) astronaut Tim Peake. Lucy Hawking and Curved House Kids have launched a new UK Space Agency-funded STEM literacy project to get 500 primary schools involved in ESA astronaut Tim Peake’s mission to the ISS. Tim’s mission, called Principia, blasts off with a launch in December from the Russian spaceport at Baikonur, Kazakhstan. As Tim lifts off, school students will follow his mission by creating a personalised log book, the Principia Mission Space Diary. With scientific and puzzle-creating support from Professor Peter McOwan and the Centre for Public Engagement at Queen Mary University of London, Lucy Hawking and the team have devised a fully illustrated activity book. The book is packed with activities that inspire children to read, write, draw, research, experiment and problem-solve while strengthening STEM, literacy and visual literacy learning. In video clips included with the programme, science communicators and experts such as Stephen Hawking, Carol Vorderman, Dallas Campbell will offer their views and insights to help the students complete their monthly mission challenges. These videos are filmed among the world-leading collections at London’s Science Museum. 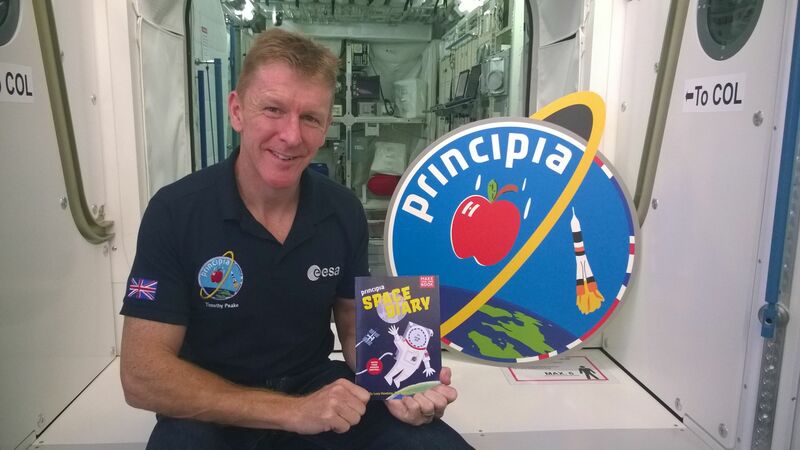 The Principia Mission Space Diary is one of nine projects to be awarded funding by the UK Space Agency, as part of a scheme to support educational outreach associated with Tim Peake’s mission. Hawking and illustrator Ben Hawkes launch the project today with a school event at Islington Central Library as part of World Space Week. About 60 students from two local primary schools will test the content of the Space Diary during a 90-minute Astronaut Bootcamp. For other schools wanting to get involved, the website is now open for sign-ups and all primary schools in the UK are invited to register at principiaspacediary.org to receive free copies for up to two classes (60 students). Books will be delivered in the first week of December. Schools will then have access to an online portal releasing new video content, teacher guides and resources for six months worth of activities. This programme is free but places are limited to the first 500 schools to sign up, so be quick! 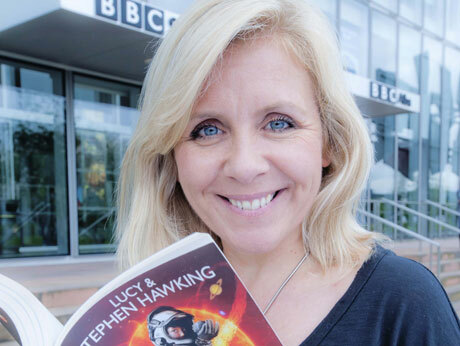 Lucy Hawking is a British author who works with scientists to write adventure stories about their research for primary school aged audiences. Lucy’s books, the George series, combine story telling with science and give young readers an exciting and entertaining introduction to the world of science and maths. An Oxford graduate, Lucy started her writing career in journalism and worked for British newspapers, radio and magazines before becoming a published author. The George series of books is published in over 40 languages and is now in production as an animated television series with DHX Media. Lucy has been recognised for her work in science and education with several awards – she won the Sappio Prize for Popularizing Science in Rome 2008 and the UNSW Medal 2015 for Science Communication and was awarded a Doctorate in Science by Queen Mary University of London in July 2015. Lucy has travelled the world giving talks about science to young audiences. She has frequently featured on television and radio, both as a subject and as a interviewer. Lucy is a trustee of the Autism Research Foundation, supporting scientific research into the condition of autism. Curved House Kids has a simple mission: improve literacy levels among digital-native children by creating books that reflect the world these children are entering– a world that is visual, interactive and full of tools that allow individuals to create. 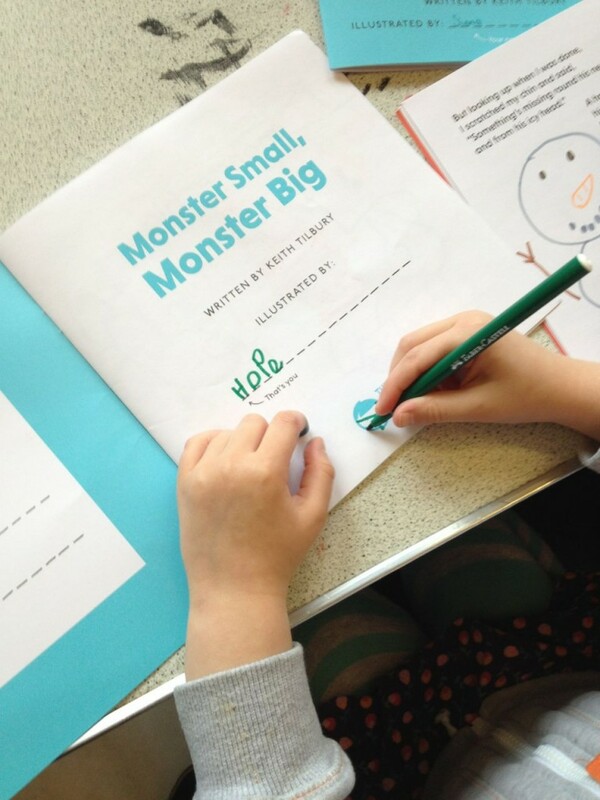 All of the Curved House Kids books and workshops empower children to make their own books – in print, digitally or both, and in doing so they nurture the instinctive visual literacy skills that digital native children possess. Making children part of the creative process ensures that they form a strong bond with books and an understanding for how reading, writing and drawing can positively impact their lives. Curved House Kids founder Kristen Harrison is a former Penguin editor who now runs publishing and design agency The Curved House, alongside Curved House Kids. She sits on the board of the International Visual Literacy Association and holds a Masters in Communications. Peter McOwan is a Professor of Computer Science at Queen Mary University of London and Vice Principal (VP) for Public Engagement. His research interests are in human perception, artificial intelligence and robotics. He is a space enthusiast and amateur magician and has used these talents successfully in a number of outreach projects, from our-space.org which charts computer games developer Richard Garriott’s adventures in space, to The Manual of Mathematical Magic, where he teaches fundamental mathematical and computing principles through simple magic trick. He is also the co-founder of the innovative cs4fn project (cs4fn.org) and holds a HEA National Teaching Fellowship award. Peter was also awarded the IET Mountbatten Medal in 2011 for his work in public engagement. In his role as VP he also oversees and champions all the College’s outreach activities created the College’s Centre for Public Engagement. Astronaut Tim Peake will begin his five-month mission on the International Space Station in December 2015, becoming the first British ESA astronaut to visit the station. 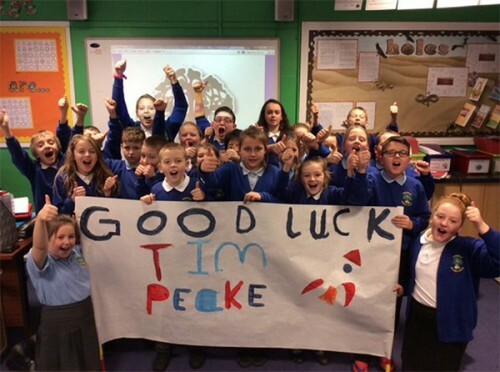 His mission is called ‘Principia’ and together with the UKSA and ESA, Tim has a number of educational outreach activities associated with the mission, designed to get children and young people engaged in STEM learning. Tim will be involved in many experiments aboard the ISS during his mission. Research in space crosses many different subjects – the unique environment of the ISS offers a great opportunity to investigate novel materials, life in space, the human body, fluid physics, new technologies and many other things. 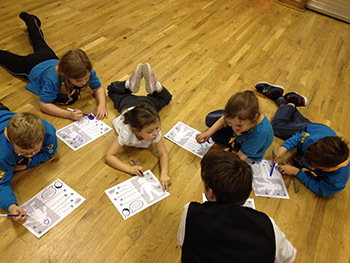 Through the Principia educational activities, students have the opportunity to engage in a rage of related activities. The UK Space Agency is at the heart of UK efforts to explore and benefit from space. It is responsible for all strategic decisions on the UK civil space programme and provides a clear, single voice for UK space ambitions. 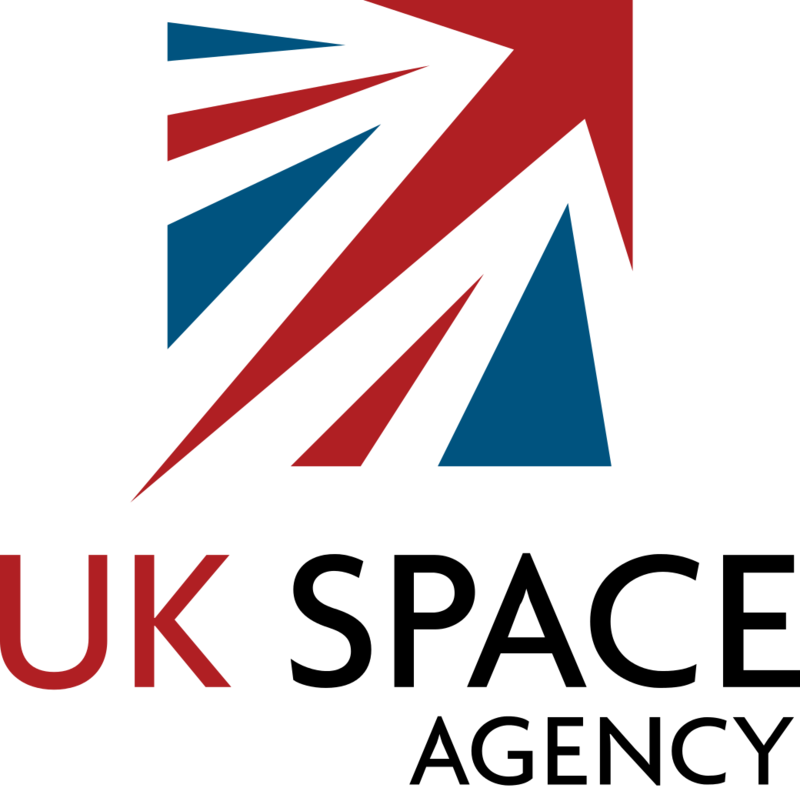 The Agency is responsible for ensuring that the UK retains and grows a strategic capability in the space-based systems, technologies, science and applications. It leads the UK’s civil space programme in order to win sustainable economic growth, secure new scientific knowledge and provide benefits to all citizens. The European Space Agency (ESA) provides Europe’s gateway to space. ESA is an intergovernmental organisation, created in 1975, with the mission to shape the development of Europe’s space capability and ensure that investment in space delivers benefits to the citizens of Europe and the world. ESA has 21 Member States: Austria, Belgium, the Czech Republic, Denmark, Estonia, Finland, France, Germany, Greece, Ireland, Italy, Luxembourg, the Netherlands, Norway, Poland, Portugal, Romania, Spain, Sweden, Switzerland and the United Kingdom, of whom 19 are Member States of the EU. One other Member State of the EU, Hungary, has signed the Accession Agreement to the ESA Convention and, upon ratification, will soon become the 22nd ESA Member State. ESA has established formal cooperation with seven other Member States of the EU. Canada takes part in some ESA programmes under a Cooperation Agreement. ESA is also working with the EU on implementing the Galileo and Copernicus programmes. By coordinating the financial and intellectual resources of its members, ESA can undertake programmes and activities far beyond the scope of any single European country. ESA develops the launchers, spacecraft and ground facilities needed to keep Europe at the forefront of global space activities. Today, it develops and launches satellites for Earth observation, navigation, telecommunications and astronomy, sends probes to the far reaches of the Solar System and cooperates in the human exploration of space. In December 2015, British astronaut extraordinaire Tim Peake will really journey to space for a 6-month mission on the International Space Station (ISS). As part of Tim’s “Principia” mission, the UK Space Agency have awarded £140,000 in funding to 9 education and outreach projects and we are one of them. OMG! Galactic news! Together with Lucy Hawking and QMUL’s Professor Peter McOwan, we are producing a Space Diary that will be sent out for free to 15,000 UK primary school children. The Space Diary is packed with activities and challenges that allow the help Tim on his mission – from preparing to be an astronaut, to experiments in space, to navigating space debris for a safe return to earth. We are looking for a small group of 4-6 teachers (in England, Ireland, Scotland and Northern Ireland) to form our testing team. We will need about 5 hours of time between now and the end of October to review the content of our book, our teaching notes and give us feedback on some adhoc questions. All this is to make sure this project is the best it can be for the 500 teachers and 15,000 students who will take part. 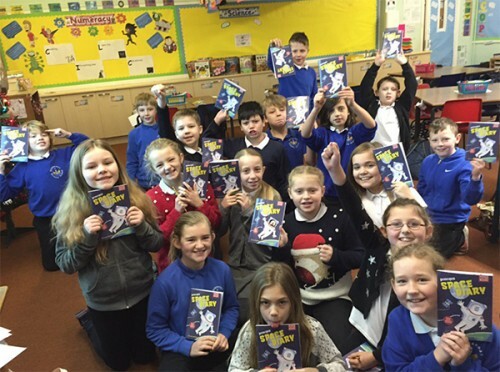 In return we will credit you in the book; we will make sure your class is one of the 500 schools to receive free books; we will feature you and your school on our blog (if you want to be featured) and your class will get to cyber-meet author extraordinaire Lucy Hawking via a Skype visit to your school. Will you join our teacher team? To join the crew, email our project coordinator Lucie Stevens at info@thecurvedhouse.com by 28th September. And for more info, read the full press release announcing the Principia funding on the UK Space Agency website. It is this very approach that guides our visual literacy workshops. Much like Weber, we aim to give student a full experience of language, not just an education about language. 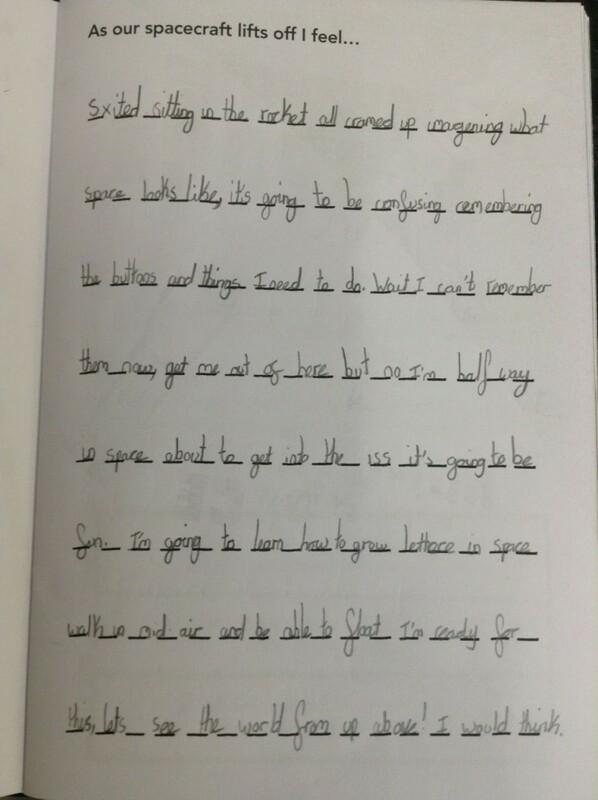 We work on core literacy learning while always mixing this with visual literacy and some kind of creative output, ensuring that all kids have the chance to create something they can be proud of. As practicing publishers, artists and writers we also bring our day-to-day professional experience into schools to give students insights into where well-rounded literacy skills can lead to. Weber’s story is the kind that inspires us – we hope it inspires you too. 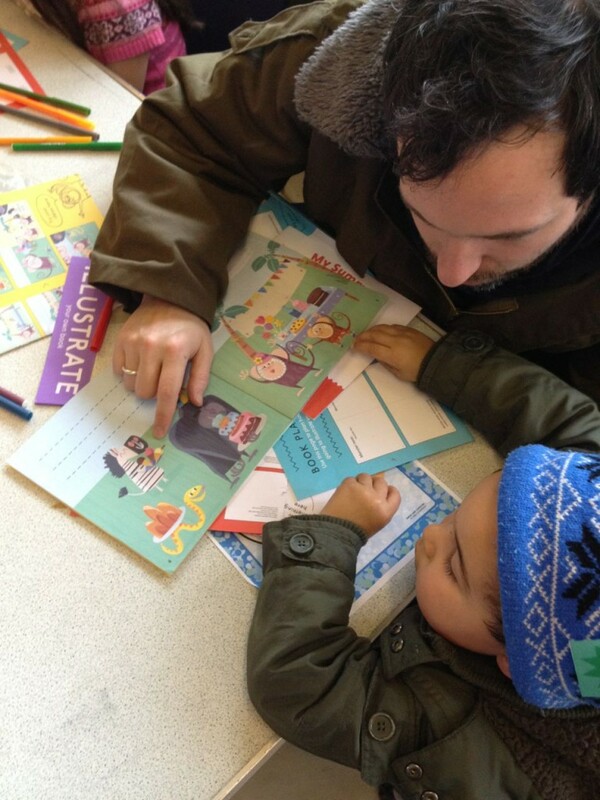 Photo courtesy of House of Illustration, taken as part of our collaborative project Our Cally Stories. 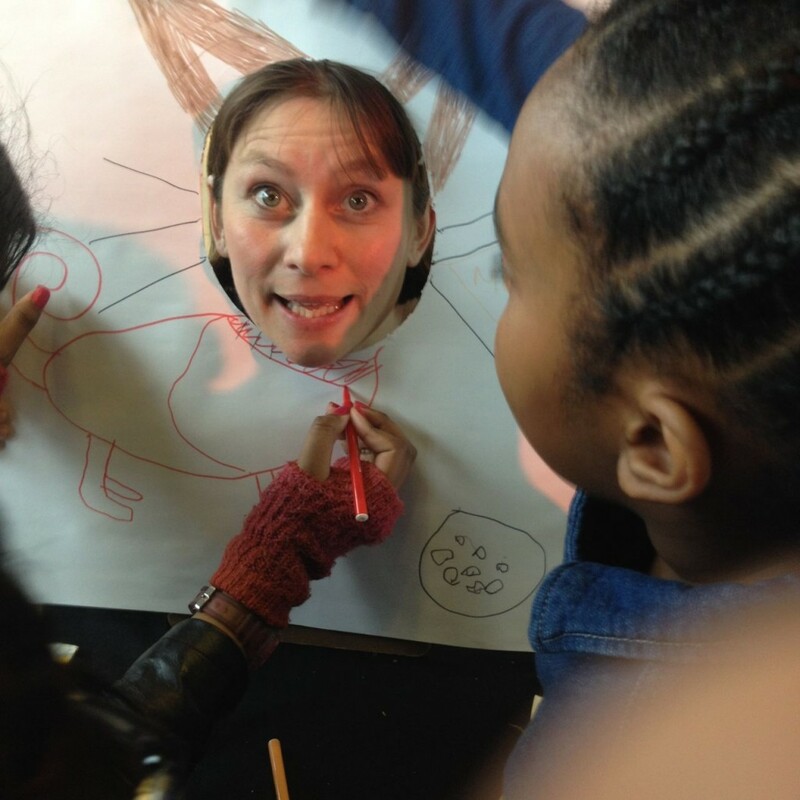 Curved House Kids and House of Illustration today announce a new partnership, offering Islington families the chance to publish their own book in an empowering series of workshops, entitled “Our Cally Stories”. Run as part of Islington Council’s Word15 festival, the 8-week programme will offer hands-on training in understanding visual and written literacy, as well as offering local families unique access to those working in creative sectors. 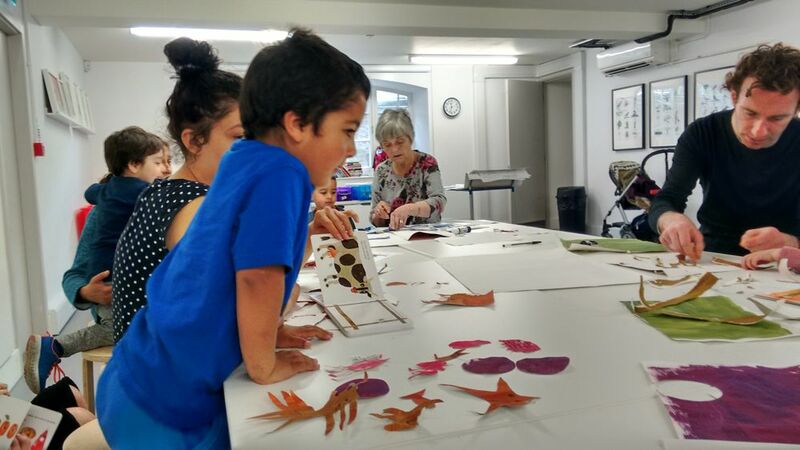 Commencing today, 23 April 2015, the workshops will be held in Holloway Library, Paradise Park Children’s Centre run by Islington Play Association and House of Illustration’s new Clore Studio at its gallery in King’s Cross. The programme will map out a typical book development workflow, led and supported by an established author, illustrator and publisher. 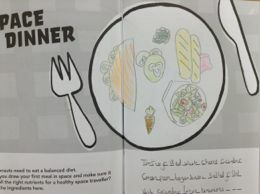 Young children and their parents will go through the process of planning, writing, editing, illustrating and publishing a professional quality book. Themes will be selected by participants, allowing them to create their own unique stories, and finished books will be produced and shared through local libraries. The final book will be launched at House of Illustration, at 2 Granary Square in King’s Cross on Thursday 18 June. The Curved House Kids produce books and downloadable learning materials, and run workshops that inspire primary aged children to read, write and see the world. Curved House Kids projects are based around the idea that visual tools and visual literacy skills can greatly improve a child’s ability to learn and that by making children part of the creative process we cement their learning (and their love for reading and storytelling) from an early age. We recognise that the world around us is now highly visual, digital and interactive and our methods engage with children the way children are engaging with the world. House of Illustration opened the UK’s first gallery dedicated solely to the art of illustration in summer 2014. 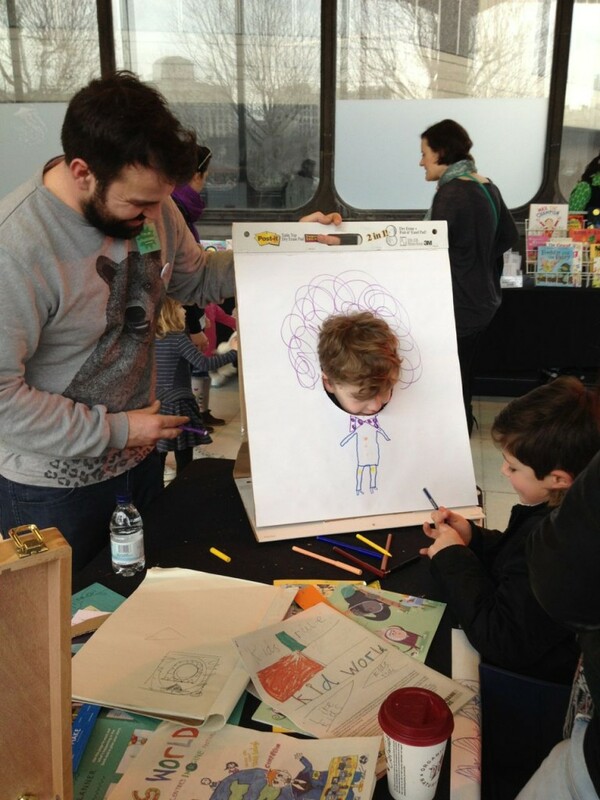 Through changing exhibitions, events, courses, workshops and competitions it aims to reach audiences of all ages to learn about, participate in and enjoy illustration in all its forms. Our education department has been running since 2009; we have delivered over 40 projects in schools with high indexes of deprivation. Now equipped with a Clore Studio, we hold regular workshops for families, primary & secondary schools and adults. 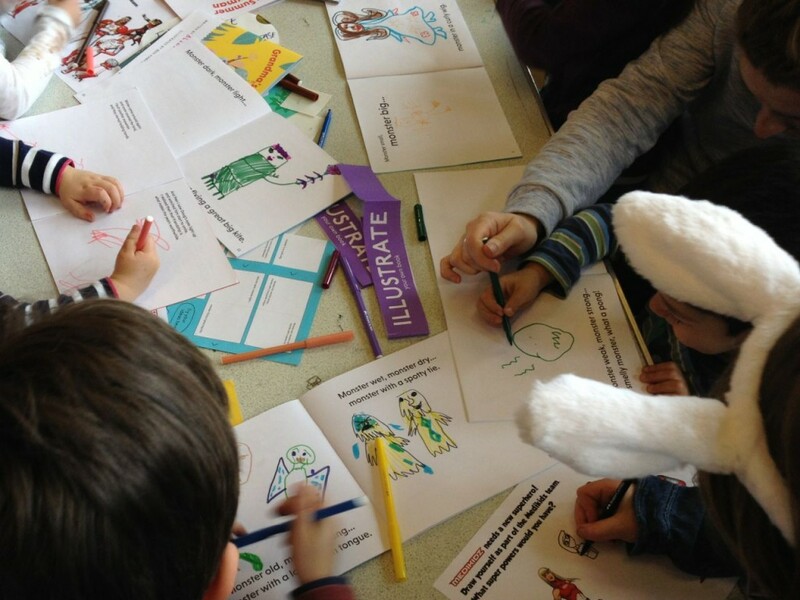 All workshops are delivered by professional illustrators and aim to empower participants of all ages and abilities with new skills, increased confidence, opportunities for creativity and enhanced visual literacy. 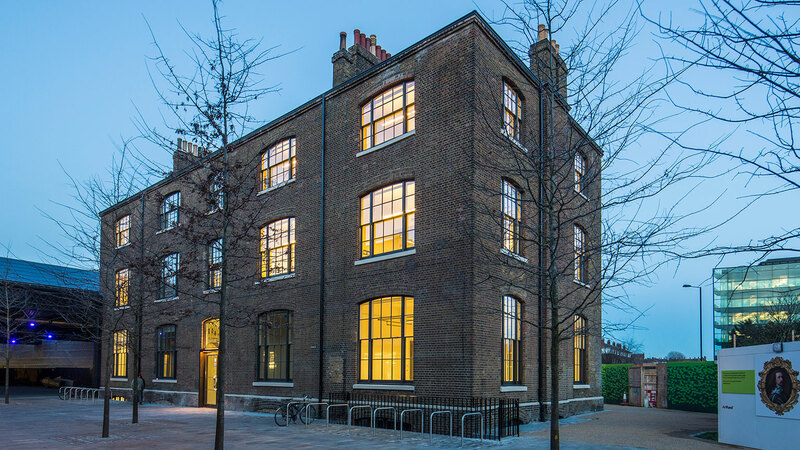 The Word festival celebrates the transformative power of words through a one year programme of high quality, commissioned arts activities, events and learning opportunities that encourage residents across Islington to develop enjoyment in reading, writing and freedom of expression. The festival is a partnership initiative between Inslington Council’s Library and Heritage Services, Arts Services, All Change and Free Word. Word 2015 will take place between 25 May and 19 June, 2015. This is an extract from an article published on The Bookseller Blog, 13 March 2013. 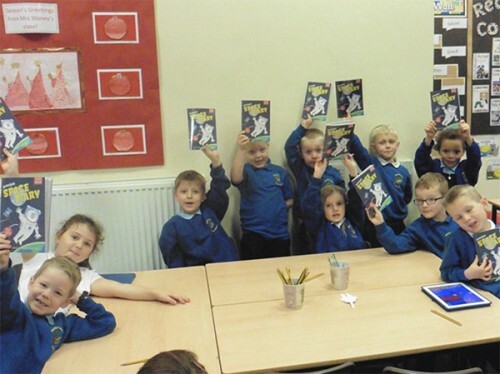 Last week was one of our favourite days – World Book Day. This annual event is a chance for parents, teachers, kids and readers of all ages to celebrate books and stories – a day to remember the reasons why we read. Our world is now split between online and offline, the virtual and the real, the physical and the digital. We all know these two realms do not exist independently of each other, which is why being able to read whatever is in front of you (whatever form that takes) is becoming more nuanced and complex. For us, finding a way for books – particularly children’s books – to acknowledge those two worlds seems more important than ever. We need to allow ourselves to be open and flexible to the idea of reading taking more forms than it ever has before – but we also need to ensure children have ways to appreciate the value and transformative power of stories, and the act of reading itself. Working in the field of visual literacy we know that digital media has transformed the volume of information presented to us on a day-to-day basis, particularly when it comes to images and messages. We see them everywhere and we often find ourselves wondering which bits to recognise and acknowledge, and which bits to stop and dwell upon, to reflect and comprehend and engage and build upon the ideas we are being shown. 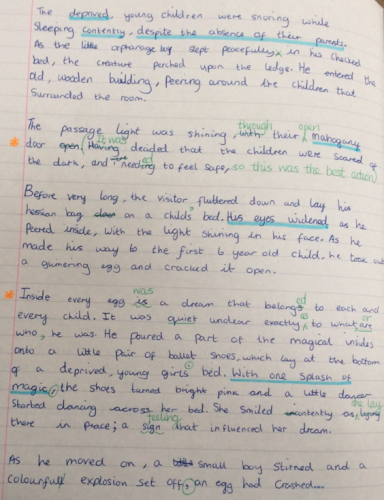 Stories are perfect for this – allowing us to spend time getting to grips with a narrative, with characters, giving our brains the opportunity to concentrate and focus. They train us to remember how to do something beyond an immediate reaction to stimuli. 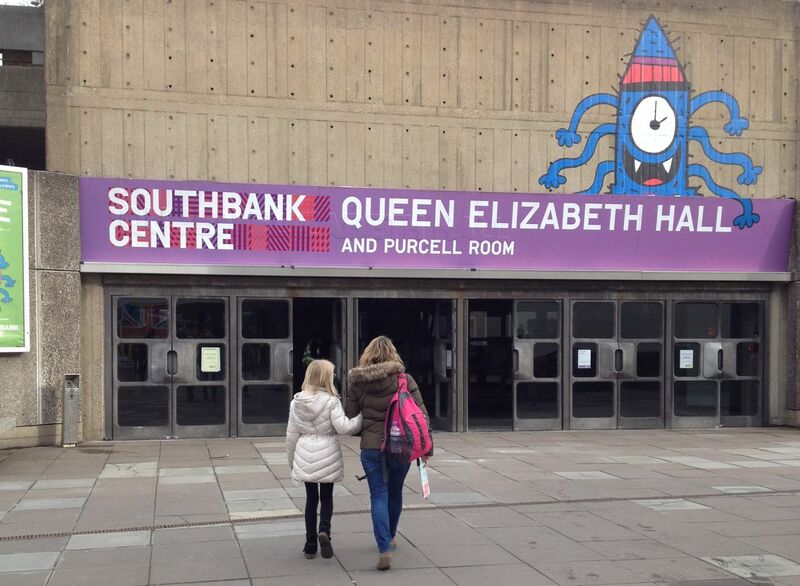 We’re back from a week in London where we took part in the annual Imagine Festival at the Southbank Centre. 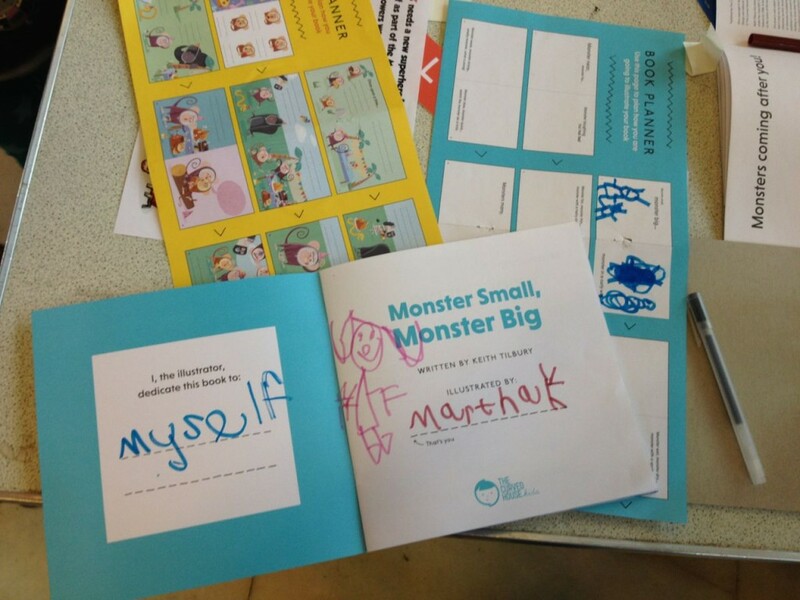 As part of the ‘Everybody Into Books’ event, organised by Inclusive Minds, we set up a book-making station and had kids help us illustrate and write our books. 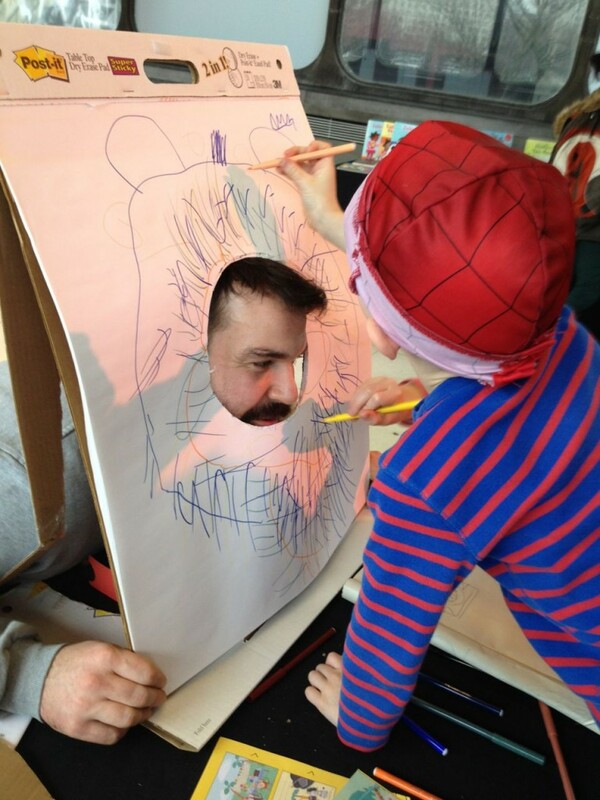 And this year we also got them to turn us (and themselves) into their favourite characters – everything from hairy monsters to floating mermaids. We made over 20 books throughout the day and are now creating ebooks and uploading them to our Kids Library for you to view and download for free! This was a special day for books. Inclusive Minds are committed to ensuring all children can access books and see themselves in stories and this event brought together organisations, like ours, that see inclusion as a priority rather than an afterthought. The organisers, Beth and Alex, assembled a panel that included some incredible, smart and articulate young people who openly discussed their experiences growing up in mixed race families and as transgender teens. They pointed out that few, if any, books published in the commercial sector reflect their own experiences and this invisibility can lead to feelings of profound isolation during childhood and adolescence. Also on the panel was one of our idols, Charlie and Lola creator Lauren Child, who talked about her own approach and that rather than try to introduce diversity for its own sake, she tries to reflect real life and narratives that all children can relate to. 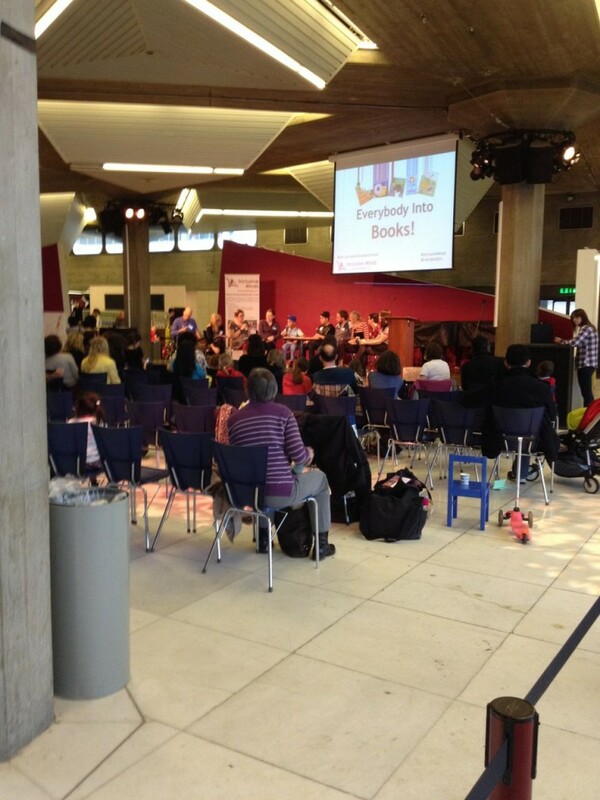 We came away from this day feeling completely energised by the insights of those who spoke, the creativity and enthusiasm of the kids who came and created books with us, and the potential we have to ensure diverse representations of people and circumstances in the characters and stories we create for kids. Until 2016 when we can Imagine again! When we teach visual literacy we don’t just teach how to ‘read’ and interpret images, we also explore the interpretation of other visual references. One of these is facial expression and, in particular, understanding emotion. Being able to interpret an emotion, and knowing how to express different emotions, are vital to our interactions with the world. This is a quick exercise to try yourself. Download and print the worksheet below. Try to turn this face into a happy face. What changes will you make to change it’s mood? Are there small changes that can make a big difference? 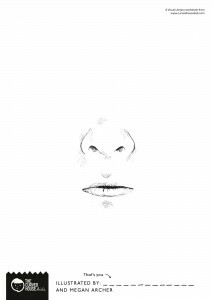 Can you completely reinvent the face? 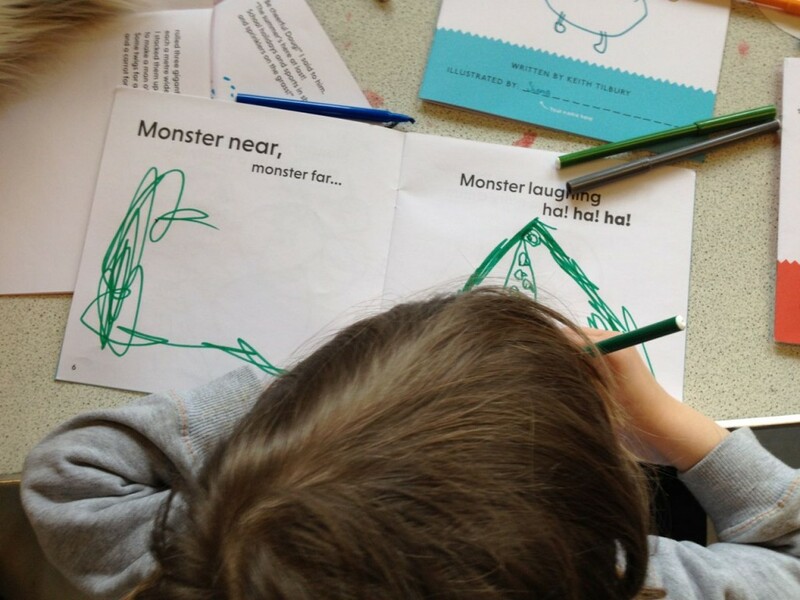 Tweet us a picture to @curvedhousekids or post it to our Facebook page, we’d love to see what you make of it. 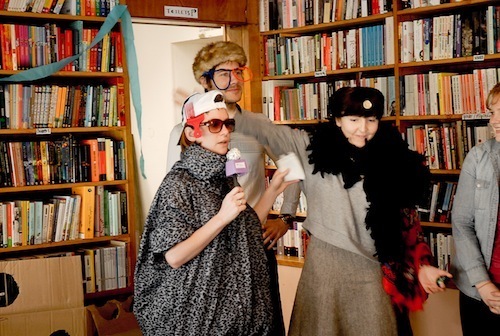 On October 4th and 5th, Curved House Kids took over a corner of one of our favourite local bookshops, Shakespeare and Sons and turned it into our very own (and Berlin’s very first) Fun Palace. But what’s a Fun Palace? 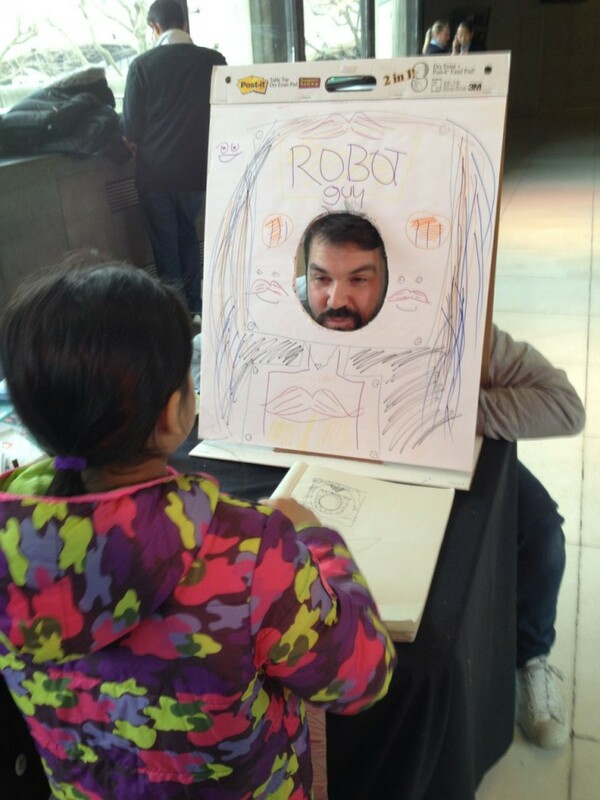 In short, it’s a free space where kids and adults can have fun connecting art and science through games, storytelling and drawing. Fun Palaces is a UK based (but global) initiative based on an original idea from the legendary playwright, Joan Littlewood and transported into the 21st century by Stella Duffy and Sarah Jane Rawlings. We had a wonderful weekend in our Fun Palace and were delighted to see so many faces, old and young. We discovered Berlin kids know how to put the FUN in Fun Palace, and that their parents can give us a run for our money with singing and dancing along. Kitty the Crystalizer rapped her heart out with her band, The Rocks. Big shout out to Mini-Metamorphic, a band member of The Rocks who managed to play it mega-cool and sleep through his moment in the spotlight. Language is no barrier when you’re learning about sound waves and making music. Take eight cups of water, a few German numbers, a poster and some eager volunteers and we had a room full of mini-Mozarts in the making. 3. Breaking the rules is best! Curved House Kids author Chester Travis’ Picture Poetry session really set the kids imaginations alight. After listening to Chester’s ferocious animal sounds and identifying them, our Fun Palace visitors could create their own mixed-up creations taking the best bits from our animal components. ‘Kick’ was a colorful huge animal that made a mix between a roar and a hiss. Our Fun Palace mural was a chance for kids to respond to speculative questions about the future. One of them – “show me a world that has never existed” – was enough to get one visitor suggesting “a machine that allows you to learn everything while you sleep”. We are pretty much convinced the kid who came up with this will be a professor one day. Learning is not just about thinking, it’s also about doing and collaborating, and seeing parents and adults getting stuck in and helping their children add to our mural, write raps, dance for our morning warmups and create their own planets for our Saturday planet parade was an inspiring reminder that the Fun Palace isn’t just an idea for kids. Thank you to Chester Travis, Megan Archer and Timothy Armstrong for sharing your artistic skills and creativity with us and the kids! And a special thanks to photographer Alice Connew for taking so many wonderful Snaps. Visit the Curved House Kids Facebook Page to see more pics from the event. 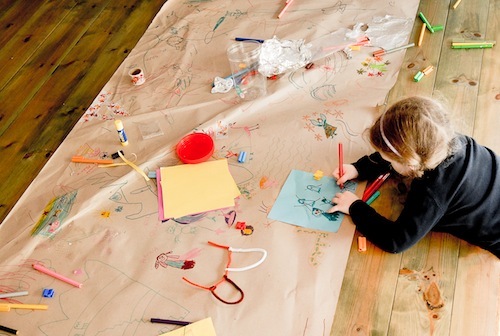 Calling all creative kids! 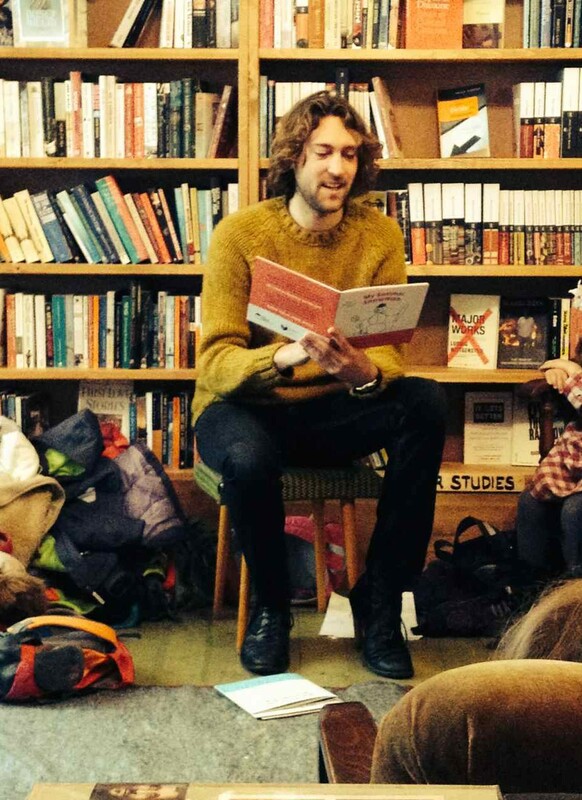 On the 4th and 5th of October, for one weekend only, Curved House Kids will set up a Fun Palace at Shakespeare and Sons bookshop. What’s a Fun Palace? 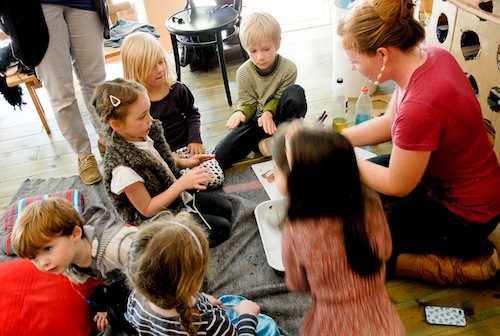 A Fun Palace is a free and creative space, where kids and adults alike can explore activities around art and science. We’ll be filling the weekend with all kinds of engaging and inspiring activities that bring science to life. With sessions looking at space, geology, chemistry, paleontology (dinosaurs!) and the animal kingdom, visitors to the Berlin Fun Palace will be able to explore their favourite subjects through storytelling, songs and games. Join authors, illustrators and artists including Megan Archer, Chester Travis, Kristen Harrison, Alice Connew and Jenna Stout for a fun-packed weekend creating Berlin’s first Fun Palace. Meet the Illustrator: Learn about space, the solar system and gravity with illustrator Megan Archer, whose book Up, Up in to Space! is published by Curved House Kids. Meet the Author: Chester Travis, author of My Summer Snowman, shares his poetry-writing skills while teaching us about the animal kingdom. Rock n’ Roll: A rockin’ game where music meets geology! Dinosaur Doodles: How would you draw a Sordes Pilosus? Or a T-Rex? 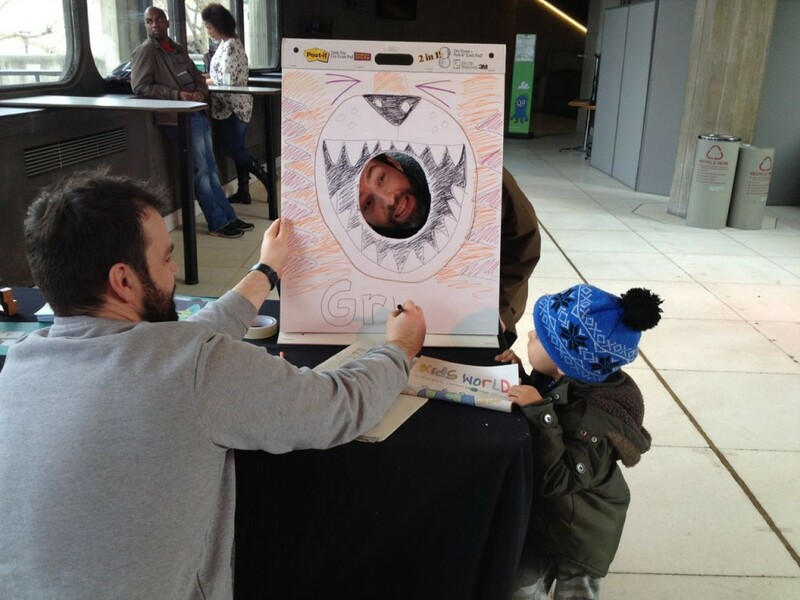 This drawing game is the ultimate challenge for dinosaur fans! 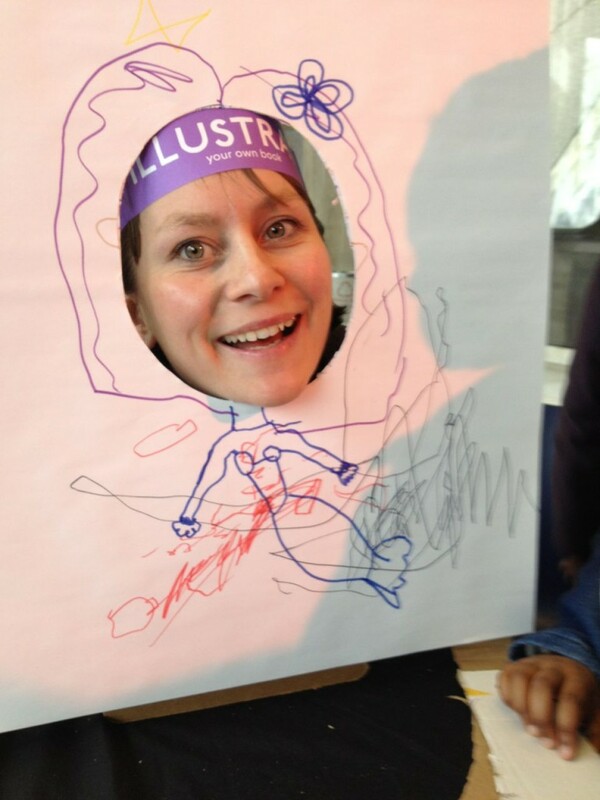 Add your drawing to our “Imagine a Future” mural inspired by author extraordinaire, Lucy Hawking! In one of her videos, Lucy asks: “Can you imagine a future noone else has thought of?”. Splashing Sounds: Learn how to make music with water and sound waves. Planets on Parade: Make your own planet mask and join our planet parade! 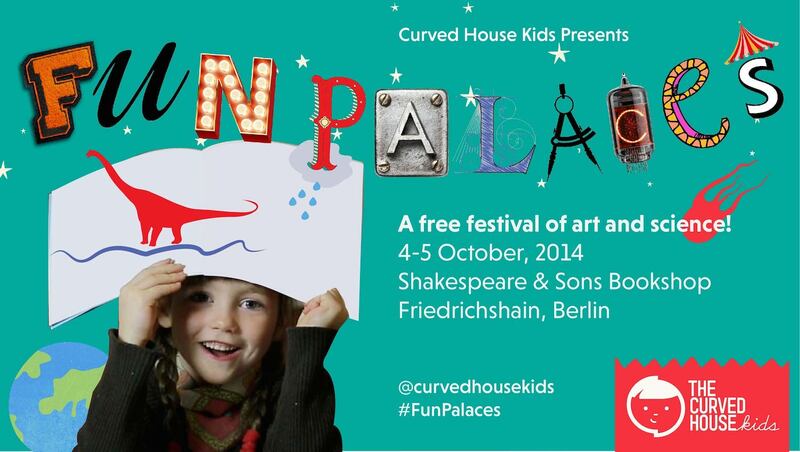 This Berlin Fun Palace is one of many Fun Palaces happening in the UK and around the world on 3rd and 4th October, 2014. Over 100 Fun Palaces have been devised to celebrate theatre director Joan Littlewood’s centenary and her vision of creating fun and engaging spaces for anyone to access. Fun Palaces is a campaign for culture that everyone can join – combining arts and sciences, welcoming and free, at the heart of local communities across the world. A full programme of events will be published on the Curved House Kids website w/c 22nd September. Founded by Kristen Harrison in 2013, Curved House Kids is a Berlin-based publishing house that develops books and learning materials that integrate visual literacy into the teaching of core reading and writing skills. Our work tackles the reasons kids may not be reading, whether it be learning difficulties, additional needs, lack of confidence, or the ubiquitous distractions of digital technologies. By allowing kids to make their own books we empower them to be part of the creative process and encourage them to form a life-long bond with books and storytelling. In 1961, UK theatre director Joan Littlewood and architect Cedric Price conceived the Fun Palace as a ‘laboratory of fun’, ‘a university of the streets’. It was to be a temporary and movable home to the arts and sciences that would welcome children and adults alike. This wasn’t possible in 1961; it’s very possible now. Co-directed by author Stella Duffy and Sarah Jane Rawlings, Fun Palace takes the best of that never-built 1960s vision and bring it into the 21st century in a weekend of events, locally curated and attended – linked nationally and internationally, virtually and actually. 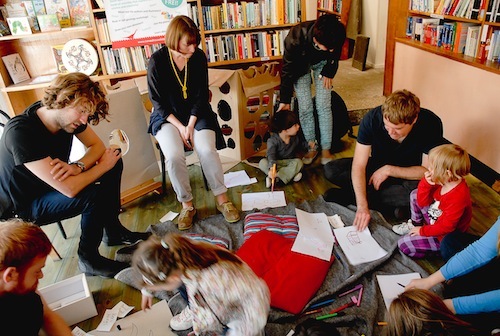 On 4 & 5 October 2014 there will be hundreds of local, pop-up Fun Palaces across the globe, each one based on the needs and wants of that community, all part of the national network of Fun Palaces. 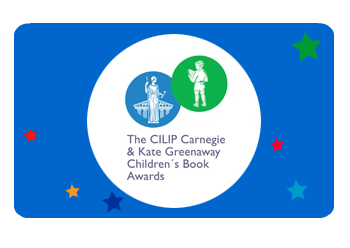 This Visual Literacy Packs, compiled as part of the celebration of the 70th anniversary of the CILIP Carnegie Medal and the 50th anniversary of the CILIP Kate Greenaway Medal awards – provide activities and teaching plans to accompany the reading of Carnegie and Greenaway award-winning books. Andrew Carnegie was a Scottish-born philanthropist (1835–1919) who established over 2800 libraries across the English-speaking world. Kate Greenaway (1846-1901) was a popular nineteenth century children’s books illustrator. The Medals are awarded by librarians to those who show outstanding excellence in children’s and young person’s literature. Check out the packs below! 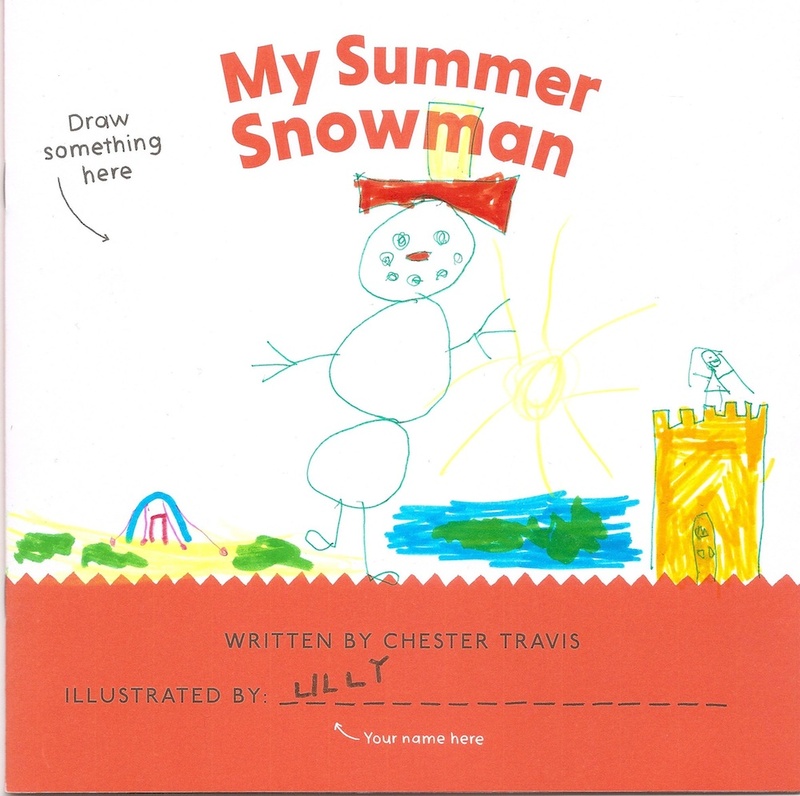 Back in December we ran a competition to get kids drawing the cover of My Summer Snowman by New Zealand author Chester Travis. The comp was won by 5-year-old Lilly (then 4) who produced this wonderful drawing that really impressed our judge, illustrator Ben Hawkes. Lilly’s prize was an author visit by the wonderful kiwi native Chester Travis. We held the event at Shakespeare and Sons in Berlin and Lily bought along her classmates to be entertained and inspired by Chester’s reading. 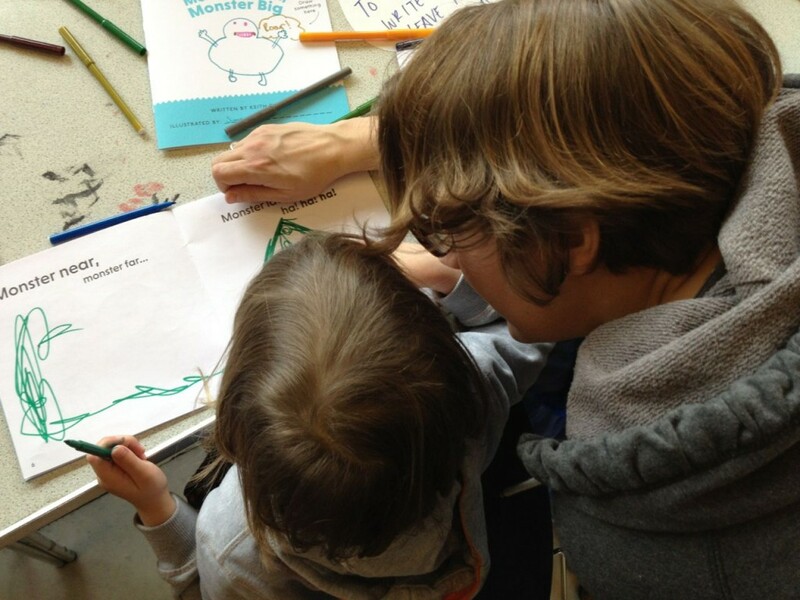 The kids got to illustrate their own page from a book and all took home a copy of one of our books. Thanks BeSmart academy for a great morning and congrats again to Lilly, keep drawing!